The Ciclone iSpinMop is the last mop you will buy. Save time and energy using its popular and innovative spin wash and dry system. This mop gets the job done in record time! Ultra Absorbent Micro-Fiber fingers absorb 100% of everything. Machine washable head. Self-standing floor mop. New fender design to avoid water from spilling out while spinning. There is no mess or dripping. 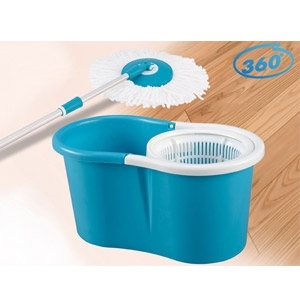 Clean and dry mop in seconds. No more touching dirty mops!